You may remember that I reviewed the Yogurt Machine and the non-dairy Yogurt starter from this company a couple of weeks back--you remember--the one where you can use ANY kind of milk and choose what healthy ingredients you want in it. If you don't remember then you can see that review here. Well Belle + Bella makes some other products as well and I got to try one of them out. This time you will be able to win a bottle for yourself as well. There will be one US winner. The Rafflecopter is below. "The GI tract and skin are both organs of detoxification. We need a healthy balance in the gut to break down food, absorb nutrients, and eliminate toxins. When there is an imbalance of our gut flora, and there are more bad bacteria than good bacteria, a lot of problems can arise — including chronic inflammation, which is a cause of blemishes and other skin problems that start beneath the skin weeks before they appear on the surface. So, if you are looking to clear up your skin, you have to start with your gut. Creams and lotions can be easily washed away by the environment and has limited coverage area, but Probiology Skin Therapy works from within your body by affecting what is known as the “gut-brain-skin axis” to help balance your gut flora with clinically studied probiotic strains that have the efficacy to help promote naturally healthy skin for the entire body. Nominated as one of the 2015 top five finalists for the SupplySide West CPG Editor’s Choice Awards in the Supplements! 30 capsules – MSPR $24.99"
I have taken these easy to swallow (which is very important to me) pills for the entire 30 days. I don't break out very often and have to admit that I had absolutely no breakouts during this time. These supplements did seem to regulate me a bit better and I have the feeling if I take them for another month my gut will be working like it is supposed to! I had no adverse reactions which is good! As always I'd advise you to check with your doctor before taking any type of over the counter supplement. Now for the giveaway: One lucky winner 18 years of age or older who resides in the US is eligible to win. The winner will receive 1 30 capsule bottle of the Probiotic Skin Therapy. Rafflecopter will be used to pick the winner. I will email that winner who must reply to my email within 48 hours with their full name and mailing address. I will forward this information to Belle + Bella who are responsible for mailing the prize to the winner. I received a 30 capsule bottle of the Belle+Bella Probiotic Skin Therapy for review purposes. All opinions expressed are my own honest opinions. For more information please check my Disclosure Statement. Our giveaways are in no way sponsored or promoted by Facebook. I have to get this for my son. He has a sensitive skin and he breaks out easily. I hope this works for him. I have read a lot about the benefits of taking probiotics. These good bacteria really helps in keeping our digestive tract healthy. With that in place, we feel better and look better. It would definitely be the yogurt maker, we have at least one each day. We use probiotics daily, I have not tried this one though. I've never thought of probiotics impacting the skin but I guess it makes sense. Bonus that they help your gut too! I love that this one helps skin and hair too. I have been taking a probiotic for GI health. 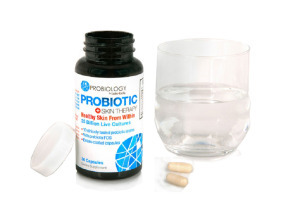 What a great review and giveaway for a probiotic for the skin! I bet it works wonders! I would love to try this probiotic for over all health reasons. I used to take probiotics but stopped when my bottle was empty. I need to start back up again. And yes, I did feel better while I was taking them. I would love to try this. I am a regular user of probiotics. My kids take them too. It helps with their eczema. I need to be better about taking something like this. It sounds like the benefits are plentiful. When our guts aren't in order, everything's a mess. I'm so glad this is working well for you. I never thought about taking probiotics for my skin! I might have to try this! I would like to try the Belle+Bella Maximum Strength Probiotic , I do not take any now. This sounds a great product indeed. I would like to give a try to this awesome product. Thanks for sharing. I'm also interested in the Maximum Strength Probiotic! Probiology Skin Therapy – Now Available! love to try it out and I have not taken any yet. I take supplements on a regular basis. I like the idea of skin therapy. Sounds like something I should try out. Yes, I take supplements daily. I would love to try this.